Carlo Del Fava has discussed his reasons for taking performance-enhancing drugs as a youngster. Carlo Del Fava (file pic). FORMER ULSTER AND Italy forward Carlo Del Fava has spoken about his ban for taking performance-enhancing drugs as a 20-year-old. Del Fava served a two-year ban as a result of his actions, before playing for Ulster between 2007 and 2009. The 36-year-old retired player, who has since become an outspoken anti-doping advocate, has come back into the spotlight after the recent controversy surrounding Gerbrandt Grobler, who was signed by Munster last summer despite having served a two-year ban for failing a drugs test in 2015. Speaking on Off the Ball AM, Del Fava explained his reasons for choosing to take PEDs as a youngster. “I wasn’t big enough, I wasn’t strong enough to cope with the level of rugby I was playing then,” he said. You’ve got performance norms that you need to meet and criteria you need to meet. I was nowhere near. “Having to cope with the pressure to stay with the group, you look for a way to try to shortcut that and you end up in hot water. “You’re so concentrated and narrow-minded that you lose sight of the bigger picture completely. Del Fava added that “you have that stigma with you forever” and suggested his issues were not part of a greater collective problem. “It wasn’t a conversation I had with anyone else. It was something I did in isolation. The South African-born former Italy international claimed current players are under a “huge amount of pressure” to take performance-enhancing drugs, explaining that factors such as social media and the financial incentives for succeeding as a professional rugby star contribute to the problem. Del Fava said that his doping past was not addressed around the time he was signing for Ulster, explaining that there were “other focuses” back then, adding that he would have been happy to talk about it if asked. 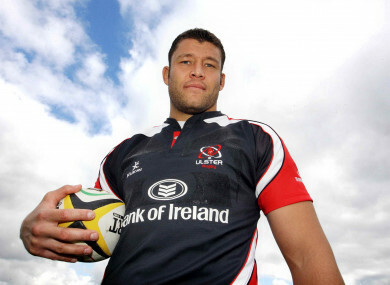 Email “'You have that stigma with you forever' - Former Ulster forward on his doping ban”. Feedback on “'You have that stigma with you forever' - Former Ulster forward on his doping ban”.